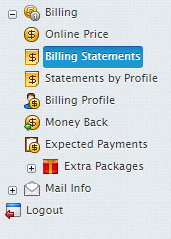 In H-Sphere you can view charges for all your accounts and by billing profiles for one account. Select Billing > Statements by Profile. Select the profile from the box and press to get statements for this profile. The Online Summary Invoice page will display your bills for all accounts. Balance shows how much money you have on your balance. A negative balance shows how much you owe for the services used. This is usually appropriate for users who pay by check and for credit card users whose credit cards failed to be charged. Credit restricts your ability to buy new resources in case your credit card fails to be charged or you have run out of your ‘check’ money. Description: the name of your current account. Total: the amount accrued for the billing period. This amount consists of accruals for all resources, including the setup, recurrent and usage fee. However, it does not include or depend on factual charges, nor is it related to debits and credits to the account. For example, if you were accrued £10 setup fee, the Amount will show £10.00, even if your credit card has been immediately credited by this amount. From: the beginning of the payment period. To: the end of the payment period. In the example illustrated above, Opened means that the billing period has not finished. A new bill is created for every new payment interval The initial setup fee is put in a separate bill.